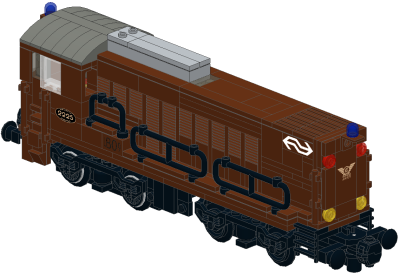 Diesel engine of the Dutch Railways for Powered Up. These engines were build in the 50th to replace the steam engines of the Dutch Railways. They were used both for freight and passenger trains. Famous are the about 50 wagons long ore trains, heading for the steelplant in IJmuiden, with were pullled by 4 of these engines. The model is designed for the new RC Powered Up system and is 34 studs long and 7 studs wide. Power Up motorset is optional/not included. You can combine up to 5 Powered Up engines to run with 1 remote control! Included are stickers for 4 different engine numbers. Nearly all parts are brand new. Other parts are in good condition. Can also be used on 9V track with a 9V motor or on 12V track with a 12V motor (low model). Only 1 bogie included. For the other bogie you need the motor. You need a 9V batterybox to build the enigine or replace the batterybox by bricks.